Today, I want to talk about something that’s very important if you want your event to go right, and that’s doing your audience research. I’ve been a professional performer for the last 15 years and 99.9% of my events go incredibly smoothly and I get great feedback. But just recently, one didn’t go quite as smoothly. When I analysed what the problem was, I realised it was because I hadn’t completed my usual thorough audience research, and I didn’t speak to the right person before the event. Instead of speaking to the client directly, I relied on some information from a ‘middle’ person. As a result, I wasn’t on top of all the needs and requirements that this client had. Everybody is different. Some clients are pretty mellow, others are very meticulous and they need things to be done in a certain way, or at a certain time. If that doesn’t happen then they’re not happy. Some people are *never* happy – let’s acknowledge that now!! But nevertheless, you’re there on their behalf. You’re there to please them and do whatever it is that they have booked you for, and whether they’re paying you or not, you still have a duty. In my book “How to be a DIVA at Public Speaking”, I include a section on what you need to know before you turn up to speak, and indeed, before you even write your presentation. Let’s take a look at a few of those items now. 1 – How many people will be present in the audience? The way that you speak to a small group of 10 or 12 people can be very different than how you address the group of 300. For example, you might include more interactivity with a small group. You can of course have interactivity with a larger group but the way you manage the audience will be very different. 2 – What’s the age range? 3 – What are their top 3 needs? Why were you hired to speak? What is it that they want from you? When they made the decision to bring you in, what was it that they saw about you that made them think that you were the perfect speaker for the job? Once you know that, then you can give them even more of what they need so they will be even happier. Maybe there’s a particular story that they heard of yours that they’d like to hear again because it would be perfect for that audience. For example, I was recently hired to speak at a STEM-related conference (Science, Tech, Engineering, Maths). When I asked why they chose me, one of the reasons related to where I went to uni and the subjects I had studied. As a result, I made sure I included a reference to both during my keynote, something I wouldn’t usually do. 4 – What’s the particular interest they have in your subject matter? For example, if I’m speaking to a group of entrepreneurs their interest in public speaking primarily will be around how to use speaking to find clients. If I’m speaking to a corporate group, their interest in speaking might be because they want to be more effective in meetings or at conferences. 5 – Are there issues or topics that you should avoid when public speaking? Is there something that you shouldn’t discuss? When I used to speak at schools there would often be a list of subjects to avoid that was included in the brief. Don’t leave it to chance – ask the client whether there are any ‘no-nos’ or taboo topics. 6 – How should you dress when public speaking? I was chatting to an HR consultant friend just recently and she shared that a client of hers specifically asked her to wear ‘grungy’ clothes when she makes her office visits. She was given strict instructions to NOT wear a suit! 7 – Is there a key stakeholder who also needs to be satisfied when public speaking? You may not get the opportunity to speak to the ‘big honcho’ ahead of time, but knowing they exist and need to be happy with your performance shouldn’t be overlooked. Questions like these are very important as, of course, are logistical questions in terms of what time you’re expected to arrive? Who should you check in with when you do arrive? Where will you be expected to wait before you actually go on to the stage and give your talk? Are you expected to stay until the end of the event? (This is always good practice if you can manage it). 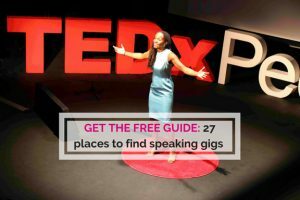 There are so many questions, and over time as you do more speaking gigs you’ll get a feel for exactly the questions that you need to have answered for you to do the very best job that you can and for your audience, sponsors, and the people hiring you to be incredibly pleased with your performance. 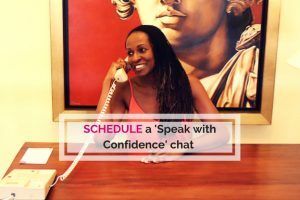 I hope you can put together your own checklist of questions that you can rely upon and that will become the bedrock for you in terms of making sure each and every speaking opportunity goes according to plan and is incredibly successful. 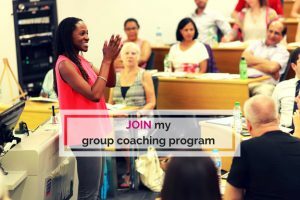 3 – Join my group coaching program – Get Clients with Speaking in 60 Days. This is a comprehensive online course for coaches and entrepreneurs who want to build their business with speaking. You’ll find thorough advice on how to become a competent public speaker as well as how to develop a marketing system to grow your business, make a greater impact and earn more cash. It also includes live workshops, Q&A calls and lots of fun bonuses.